1. 100% non-allergenic Silicone rubber. Reusable, Durable, Washable, Stretchable, Comfortable, Snug-fit, Easy to apply and remove. 2. It is a precision molded "transitional tool "which offers the ultimate solution for sore fingers experienced when learning to play guitar, (also great for those who may play infrequently). 3. fingertip protectors / guards, allow for PAINLESS play. You can play or practice longer while your fingers continue to toughen. 4. A great "transitional tool" for beginners which still allows for "GRADUAL" Callus development! Works equally well for other stringed instruments, banjo, mandolin, ukulele. 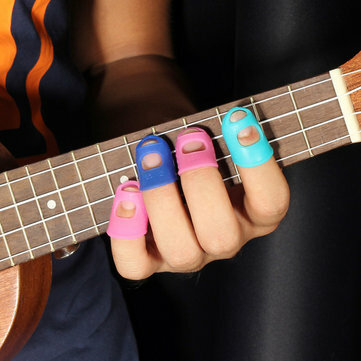 The 4 In 1 Guitar Fingertip Protectors Silicone Finger Guards For Ukulele is great for when you don't have a callus on your finger tips and your fingers become tender from playing the guitar frets so you wear these little beauties and you can keep playing your heart out without the wear and tear of hurting your fingers so for that reason I recommend this product.